Doughty Cassiodorus may have kept alive the seven liberal arts and the teachings of Martianus Capella, but if my learned colleague J. A. Willis is right, there is some justification in the reckoning that 94 per cent of of classical Latin literature was lost in the intervening period between Rome's downfall and Charlemagne's rise to power. The article did provide a reference (see the attached image), but I was not able to find the referenced document anywhere after an extensive search online. Therefore, I was left uncertain as to whether the claim was valid or not. I then thought of contacting Dr. Trompf himself through email, but have not been successful so far. In the meantime, I decided to post my concern as a question here with the hope that someone might either have access to the aforementioned reference, or is able to substantiate the claim with historical evidences. It's hard to see how this claim could be substantiated given that we don't know how much existed in the first place. No doubt the Roman world produced many literary masterpieces of which we are completely unaware. The total number of writers regarding whom any notice has been preserved to us is 772, so far as recorded in the pages of Schanz and Teuffel. How many more actually figured in the course of Roman literary history we have no means of knowing, or even of guessing with a fair chance of coming near the truth. Granted, this article dates from 1905 and finds have been made since, but our knowledge remains patchy. The author of the source cited by Trompf would appear to be the same J. A. Willis listed as a former Professor of Classics and Ancient History at the University of Western Australia (1962 - 1988). I have found a few citations of his articles, but none of them are the one cited by Trompf. None of the sources cited in this posted, most of which post-date Willis' 1968 article, mention the estimate of 94%. Also, as with the OP, extensive searching has turned up no further sources which cite Willis' figure. Although not stated, the 94% probably refers to titles / works. If so, Willis' estimate of 94% lost may be based on known works. So what estimates are there? Estimates of the percentage of classical literature that is thought to have survived to the present vary; one widely used estimate is only ten percent. 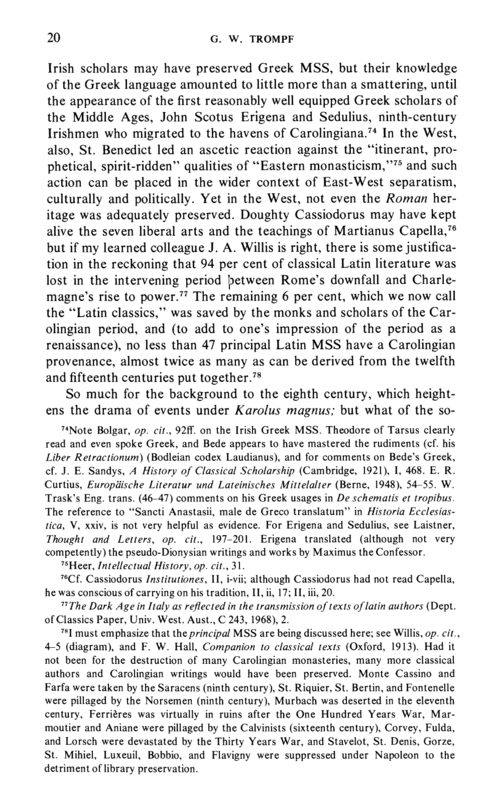 This article cites Scribes and Scholars: A Guide to the Transmission of Greek and Latin Literature by L. G. Reynolds and N. G. Wilson, but I can find no mention in this book for this estimate (I have a copy), so the above '10% survived' should be taken with a very large pinch of salt. The article Reference for the claim that only 1% of ancient literature survives gives us a different figure and, as with the above 10%, is not specifically for Latin literature. Only a small portion of Roman literature has come down to us, and we should never forget how much has been lost. It is....hardly surprising that the survival of literary works has been haphazard at best. The Cambridge History of Classical Literature, vol. 2 Latin Literature makes similarly vague statements in relation to different authors and genres. for Latin, we have the names of 772 classical authors. Of these, not a word survives from 276 of them. We have fragments ranching from an aphorism to several pages of 352 of the authors. Of the remaining 144, we possess at least one of their works but rarely all of them. Not the answer you're looking for? Browse other questions tagged roman-empire literature late-antiquity or ask your own question. Is there a factual basis for the character of Morgan le Faye from the King Arthur tale?